Walking is a type of cardiovascular exercise. If you are dedicated to your goal of losing weight, then cardio is a must. According to the American College of Sports Medicine, 30 minutes of cardio five times a week helps promote health benefits, and 60 to 90 minutes promotes weight loss. If you want to challenge yourself the next time you step outside to meet your requirements, experience the benefits of walking up hills. The inconvenience of exercise is often a deal breaker with people looking to get into better shape. Driving to a gym that's on the other side of town is a daunting task. It also takes initiation fees and monthly fees to use the facilities at a gym. Not only is hill walking convenient, it is also free. All you need is access to hills in your neighborhood. If you only have one hill nearby, simply walk up and down it for an extended period of time. You don't even need roads. Walk through trails, fields or even in your lawn. Walking on flat ground takes effort, it definitely burns calories and it also improves aerobic capacity. What it lacks is intensity. It is true that you can turn a lazy stroll in the park into a power walk by pumping your arms and walking with more authority, but the bottom line is, you are still on flat ground. When you walk up hills, you are moving vertically. This forces you to work with more effort. Not only can you lose weight by hill walking, but you can also tone multiple lower body muscles. The glutes and hamstrings, for example, are involved with knee flexion and hip extension. While walking on flat ground, there is a minimal amount of stress on these muscles. Once you walk up hill, you need to actively contract these muscles to make it to the top. The same holds true with the calves. These muscles are on the lower back part of the legs, and they get worked when your toes point down. This is called planter flexion, and when you walk up hills, you have to forcefully contract your calves. Running places a high amount of stress on the knee, hip and ankle joints. Due to the intense nature of walking up hills, you will feel a similar intensity as running without all the impact. Osteoporosis is a condition that causes the bones to become weak and brittle. Although this is more common in females, men are susceptible, too. A way to prevent this is through high-impact activities like running, jumping rope, playing tennis and dancing. 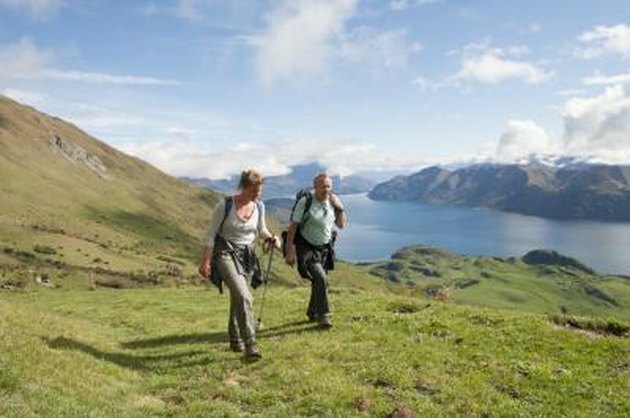 If you are not able to do these high-impact exercises, hill walking is just as effective. Also remember that hill walking strengthens the leg muscles. Any time you strengthen muscles, you also strengthen bones. Being that it is harder to walk up hills than on flat ground, you will get a higher intensity workout, which means you don't have to workout for as long. This makes it beneficial if you have a busy schedule and do not have a lot of time to exercise.